Obituary for Janet McRoberts | Langeland Family Funeral Homes, Inc.
Janet McRoberts (age 96) passed away peacefully on June 19th, 2018 in Salem, OR. She was preceded in death by her beloved husband, James Burton McRoberts (1921-1957) and will be laid to rest next to him in Mount Ever Rest Memorial Park in Kalamazoo, Michigan. Also preceding her in death were her parents, Paulus and Mary Ligtvoet, sisters Mary Frances and Dorothy (Robert) Weeber, brothers Marvin and William (Phyllis) Lightvoet. She is survived by her children, David, Sheryl (Tom), Susan, and Stephen (Eileen) McRoberts. In addition she has 6 grandchildren and 5 great-grandchildren. Janet was born and raised in Kalamazoo, Michigan in the Westnedge Hill neighborhood and spent memorable summers at their family cottage on Gull Lake. She attended Parkwood School, Kalamazoo Central High School, Moody Bible Institute, Wheaton College, and later Western Michigan University. She taught elementary school for a number of years in the Lawton Public Schools, retiring in 1983. 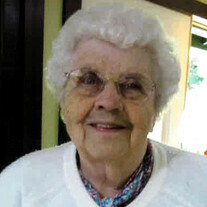 She was a long time member of Calvary Bible Church where she enjoyed her Sunday School class. Visitation will be held from 5:00-8:00 PM, Friday, July 6th and funeral services on Saturday, July 7th at 11:00 both at Langeland Family Funeral Homes, Memorial Chapel, 622 South Burdick Street, Kalamazoo, Michigan 49007. Internment at Mount Ever Rest Memorial Park, 3941 South Westnedge Avenue, will follow the funeral service. Donations can be made to Calvary Bible Church, 855 South Drake Road, Kalamazoo, Michigan 49009. Please visit Janet's personalized web page at www.langelands.com to sign the online guest book or leave a message for the family.